Iryna called me up on a hot Friday afternoon and invited me to a concert at the Sniatyn library. Not one to refuse such invitations, I accepted without really knowing what to expect beyond some kind of classical music. I was in for a treat: 45 minutes of music played by two students of the L’viv National Music Academy. Dima, on the violin, is from Sniatyn — actually the cousin of two of my pupils. Oleksandra accompanied him — and played some nice solo Chopin — on the piano. Other composers included Sibelius, Elgar, Vivaldi, John Williams, and Sarasate. And a shout-out to the Americans with John Williams! This entry was posted in community, culture, Highlights, music, pictures, video on 07.07.2012 by taplatt. 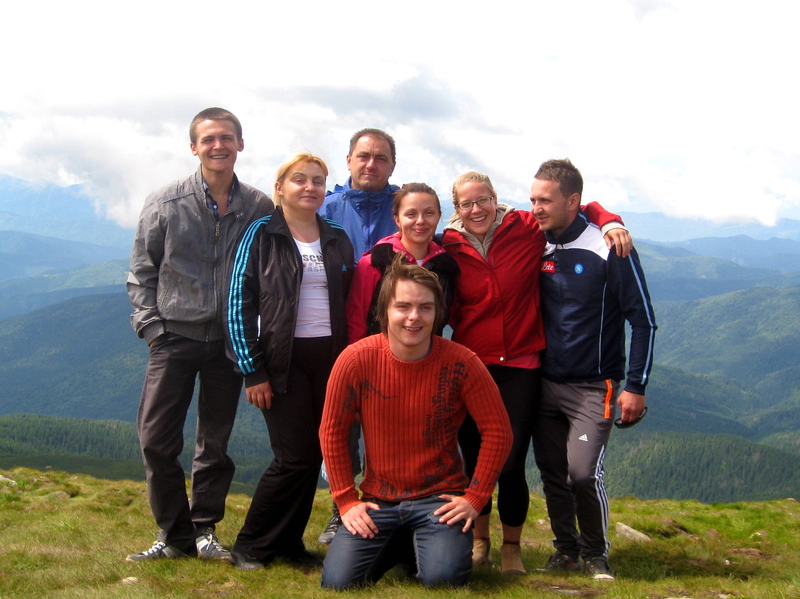 Last week my counterpart, Halya, and her family (they also happen to be my neighbors and adopted Ukrainian family here in Sniatyn) invited me to climb Mt. Hoverla with them. Of course I accepted the invitation. 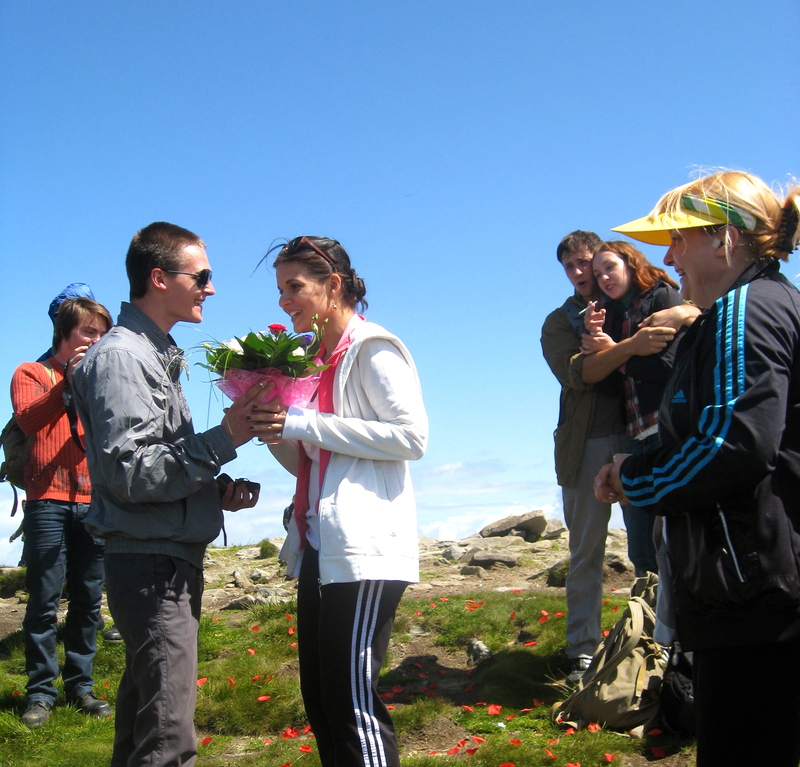 Hoverla is the highest peak in the Ukrainian Carpathian Mountains — 2,061m (6,762ft). I last climbed it in March 2011 in cold, snowy conditions. We never actually made it to the summit that time because it was too icy and windy. In case you missed that, Anya said yes. It was pretty exciting to witness such an event. After the proposal, we had champagne and chocolates in celebration. The hike down took me 1:12 (active walking time) — I enjoy hiking down better than hiking up because it’s more technical and you have to think ahead about where to step and hop. Also you don’t get as sweaty. For photos from the hike — as well as other photos I’ve taken in the Carpathians in different seasons — click HERE. This entry was posted in celebrations/holidays, climate, exercise, geography, health, Highlights, pictures, video and tagged news on 02.07.2012 by taplatt. What a mish-mash post title, you must be thinking to yourself, what do these things have in common? Well, they were all part of my good friend and neighboring-village-PCV, Janira’s, second annual Dance Competition/Fundraiser at her school here. Janira has a weekly dance club for her pupils and for the second year they prepared dances to put on a performance in order to raise money to buy English textbooks for the school. Like last year, Janira invited a bunch of us PCVs to help her out during the event and put on a little concert after the girls danced. The girls danced really well — as one of the judges, I can say it was quite hard to choose the winners — and were much improved from last year. The PCV mini-concert was a blast: Ryan played his banjo and sang some classic bluegrass tunes with Abe accompanying on his washboard and a few of us helping out on vocals. Adam had brought his saxophone and so played a couple solo tunes before helping out with the bluegrass numbers. This entry was posted in celebrations/holidays, community, culture, education, language, music, Peace Corps, pictures, teaching, video on 28.04.2012 by taplatt. UPDATE 16 March: I found & uploaded more videos, so scroll down for eight extras! Sunday afternoon, 3pm. Post-long run and pancakes. What better thing to do than go to a concert? A bunch of my pupils attend Sniatyn’s Music School, and a couple had invited me to the concert. It was a joy to sit and listen to live music for two hours. At points throughout the concert a silly smile came to my lips; I miss watching and making music. Most of the music was traditional Ukrainian, but there was some Grieg, Prokofiev, and Saint-Saens as well. The concert had it all: singing, violins, clarinets, ensembles, Ukrainian folk instruments… Kids here memorize all of their music. Below, a selection of short videos of many concert moments. This is my talented 7th form pupil, Valya, playing beautifully on the piano. She’s also quite a good figure skater. This entry was posted in community, culture, education, Highlights, music, teaching, video on 12.03.2012 by taplatt. The following was a new one for me and I loved it — it’s beautiful. Not sure of the actual name of the song, though. This next one was also new for me. It talks about Ukraine as a homeland & mentions the green Carpathians. Set in sort of a melancholy key, but still beautiful. I don’t know the proper name of this one, either. The duet is sung by my pupils Iryna (7A) and Iryna (8A). I’ve previously posted and translated the following song, “Карпати” (“Carpathians”). Here it is again, this time with my 10A pupil, Christina, and a friend of hers. This entry was posted in celebrations/holidays, community, culture, Highlights, music, Ukrainian Tunes, video on 08.03.2012 by taplatt. I took a few short videos with my camera when Emma, Michael, and I traveled around in January. Ukrainian New Year carols, choirs, church bells…enjoy! This entry was posted in celebrations/holidays, Highlights, Kyiv, music, religion, video on 29.01.2012 by taplatt. This next one, “добрий вечір тобі,” (dobryy vechir tobi = “good evening to you”), is a classic. As in I’ve heard it so many times already that I almost know all the words. But I like it. And this one’s called “Нова радість стала” (nova radeest’ stala = “discover the joy”). Also a popular one. This entry was posted in celebrations/holidays, culture, language, music, religion, video and tagged Christmas, New Year on 29.12.2011 by taplatt. I was really surprised this week when almost all of my classes gave me little Christmas gifts — a stocking, pretty bulbs, cute foam snowmen — and wished me well for “my” Christmas (Ukrainians don’t celebrate XMas until 7 January). Even my school director singled me out at the teacher meeting on Friday morning and all the teachers applauded to wish me a Merry Christmas. Dear Ms. Tamila PlaT! 6-B Congratulate you from Chrismas Jsus God! We wish you a merry holy supper, happy holiday and good presend from Santa Clauses! In Christmas in your will many presemt in the stocking wery Beatyful Christmas tree and in your house will sung many carols! Merry Christmas! your 6B class! They’re still learning…They also sang “Jingle Bells” to me. This entry was posted in celebrations/holidays, community, Highlights, music, teaching, video and tagged Christmas on 23.12.2011 by taplatt. Officially — today’s the winter solstice, or Wintersonnenwende, as a German friend tells me — and unofficially — we had our first sticking snow this week. Bring it on, winter! I had one of those amazing runs this morning; one of the runs that makes you glad to be alive, that makes you run with a smile on your face, that makes you want to sing out loud but you can’t because you’re running. It was 12°F (“feels like 12°F”) so I bundled up, drank some Starbucks Christmas Blend coffee (thanks, Kate! ), and headed out for my hour+ long run around 8:10am. Wow. It was cold but my hip-hop tunes were pumping and I ran one of my favorite routes. Let’s just say that 12 degrees didn’t feel so cold when there was so much beauty around me: a quiet sunrise revealed a cloudless blue sky, and all the trees were fuzzy-white with snow and frost. I ended up running a brisk pace for eight miles and returned home for another cup of coffee and these pancakes as a reward. Holiday celebrations began in earnest this week at school. Last year I had barely been at site when all of the holiday performances happened, so they all kind of blurred together. This year I know my pupils and their teachers so I get invited to specific performances. Today one of my favorite classes (I know teachers aren’t supposed to pick favorites, but let’s be honest — we totally do it), 3Б, had their New Year celebration. As I’ve said before, New Years’ in Ukraine is like a mix of our Christmas and Halloween — kids dress in costumes and go door-to-door caroling. The 3Б celebration had a fairy tale (казка = kazka) theme. I’ll let the videos speak for themselves (pictures in slideshow farther down). Today was also the District Methodological Cabinet celebration, which also had a fairy tale theme. There were funny skits and they announced the district Teacher of the Year winners in Biology, Ethics, Ukrainian Literature, and English. My colleague, Nadia Yaroslavivna, won for English Teacher of the Year! I was quite pleasantly surprised and really proud of her. She’ll go on to the Oblast’ English teacher competition. In true Ukrainian fashion, Я бажаю вам здоров’я, щастя, успіхів та любові (Ya bazhayu vam zdorovia, shchastya, ucpikhiv ta liubovi). I wish you health, happiness, success and love as we enter this new year. This entry was posted in celebrations/holidays, climate, community, culture, education, exercise, food, language, music, pictures, running, teaching, video and tagged news on 22.12.2011 by taplatt. Летять далеко шукати рай. Fly far to look for paradise. Бо тут смереки, бо тут мій край! For spruce are here, for my land is here! Тут мені дала доля два крила! It gave me the fortune of two wings! Бо росла в Карпатах, де орел літа! For I grew up in the Carpathians, where there are summer eagles! Сині-сині ночі, небо і вода! There are blue, blue nights, skies, and water! Бо на Україні осінь золота! For in Ukraine autumn is golden! Хто мене не любить, тих мені шкода! I pity those who do not love me! Знову у рідний край. Again in their native land. Забувши втому, садів розмай. Forgetting weariness. Кожен день пила воду з джерела! Drank water from the source every day! And here’s a clip of a pupil from my district singing the same song. Who do you think sings it better? This entry was posted in community, geography, language, music, video on 27.10.2011 by taplatt.